Tapeless video cameras. 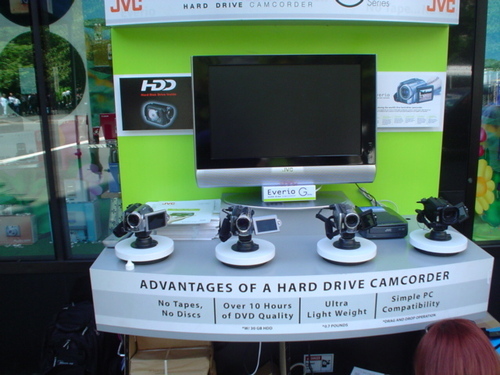 JVC picked J&R Music as the place to launch this new product line in New York. can get 7 hours and 10 minutes worth of DVD movie quality. translates to a 60 minute segment uploading in just 5 minutes. How durable is the hard drive? in New Orleans and I sure wish I’d had one with me. The name of the product is Everio and the product codes are GZ-MG77/MG37 and GZ-MG27/MG21 respectively. P.S. Do you want to be notified when new articles like this one are posted to the blog? Sony has one, too. Reviews I’ve read say the Sony one has better video quality. I’ve been eyeing these for a long while. The GZ-MG70 is equipped with a 30GB drive, which is capable of storing MPEG-2 video for a little over 7 hours at the Ultra Fine quality, 10.6 hours at Fine quality, a little over 14 hours at Normal quality and about 37.5 hours at Economy quality (the quality Ken’s referring to). Unfortunately, the DZ-MG70 has no mic input, nor headphone jack, nor accessory shoe. So, if you’re looking to add more audio options, you won’t find it here. For the casual, point-and-shoot operator, the onboard mic quality will be well suited for your needs. The onboard microphone sound is rich and full in all recording modes, except for the Economy quality. The Dolby Digital (Stereo) audio encoding at Economy quality is set at 128kbps, which is still fairly high, but is noticeably more compressed than the other settings. I just purchased the 30GB model last weekend. So far, it seems to be fantastic. Even at the highest quality setting you can still record over 7 hours of video. The optional extended battery takes the battery life up to 5+ hours at the internet quality setting. The zoom will zoom in on an eyeball from about 30 feet away. The sound quality is fine within the same room but gets a little weak at about 20 feet. All of this and it fits in the palm of your hand. Recently I purchased a Sony HDR-HD3..the top of the line. Wow, what a camera, in HD too. However, it does use a HD tape and may take a bit longer to upload into my MAC but the quality of the images is worth it. It also takes 4M stills that are brilliant. All kinds of goodies for adjusting backlight, remote mike, etc, etc. Take a look at the sony site. I own the Sony DCR SR100. So far, it’s performed above my expectations in terms of A/V quality and ease of use. It really is perfect for the small marketer who wants to self-produce shorter clips for the web. Truly a huge time-saver vs. real time capturing. The software Sony gives you to move the MPEG files from the camera to the PC is pretty basic, but it’s got a nice one-click feature that lets you quickly move all videos into dated folders on your PC. It even remembers which videos you’ve already off-loaded so there’s no repetitive off-loading going on. Yes, the high definition version is obviously better if your goal is to play back on a high def TV, but if your goal is to create web video, then the SR100 will produce equal quality by the time you encode the file for web hosting. Personally, I use On2 Technology’s Flix Pro 8 to encode my clips into Flash 8 .swf or .flv files. On2’s compression technology was chosen by Macromedia to use in Flash 8, so the output quality of this $249 encoder is incredible, and the interface is much, easier to use and offers more refined output settings than Macromedia’s full blown Flash app. I’ve also used my Sony camera with Serious Magic’s Visual Communicator 2.5 for some green screening scenes. Worked perfectly. Be sure to go out and get yourself an external hard drive to back up your video files, because unlike tape or DVD cameras, there’s no backup being made automatically. Another option… tape camera with a hard drive attachment. Advantages: 1) You can use any camera you like and 2) You have a tape back up just in case. which uses 8 GB solid-state memory cards! …having said that this is a Semi-Pro level camera. Now if only these folks knew how to monetize!